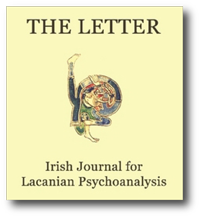 It will come as no surprise to our regular readership that this third and final issue of volume III of THE LETTER is given over to the proceedings of the Third Annual Congress of the Association for Psychoanalysis and Psychotherapy in Ireland which took Lacan’s 1964-65 seminar on Crucial Problems for Psychoanalysis as its theme. Since its inception the congress has progressively grown from strength to strength, its momentum being such that the Editorial Board was left with, while not a crucial problem, a problem nonetheless. The number of papers presented at the congress exceeded the limitations of the journal size and so a selection of articles from those presented had to be made. Those having a more direct bearing on Lacan’s seminar are contained in this issue, while those following the theme of Crucial Problems for Psychoanalysis in a related way will appear in issue ten. In the paper which opened the Congress, Cormac Gallagher noted that this year’s assembly of practitioners, teachers and students of psychoanalysis would be addressing one of Lacan’s least well-known seminars, rendered inaccessible not only in virtue of the imposition of a policy of censorship with regard to the whole of Lacan’s works but also because being ‘(n)either edited nor published in French, it is available only in a typescript which has many gaps’. The text available to the English- speaking follower of the seminar is Cormac Gallagher’s unpublished translation of that typescript. In the blink of an eye one slips easily from 1997 to 1897 when on the 22nd of December Freud wrote to Fliess: ‘Have you ever seen a foreign newspaper which has passed the Russian censorship at the frontier? Words, whole clauses and sentences are blacked out so that what is left becomes unintelligible’. While it is by no means my intention here to suggest that we are left after the year’s work with a text which remains unintelligible, it is nonetheless with a certain sentiment of the Unheimlich that one notes that the way in which the text of the Crucial Problems for Psychoanalysis comes to us echoes the initial themes of Freud’s earliest work on the unconscious one hundred years ago and specifically resounds with the themes of The Interpretation of Dreams. All at once we have a little bundle of transference-censorship-translation, of Ubertragung-Zensur-Ubertragung, through which to sift. If Freud marks this Ubertragung-Zensur-Ubertragung as happening ‘at the frontier’ and if the Crucial Problems marks or constitutes a frontier between Freud and Lacan, we might ask ourselves what frontier is constituted in Ireland when in the course of Ubertragung-Zensur- Ubertragung the objet-a becomes the o-object? What can it possibly mean when a French objet a, looking at its reflection across Irish waters, finds mirrored there an English o object? Perhaps the obvious answer-is that it means nothing at all,’that it is a mere nonsense, that the cotton reel is the cotton reel whether it be here or there. But if Freud could look at a little German child playing at ooo and aaa, thus immortalising the cotton reel of a fleeting childhood moment, if his observation could be picked up by Lacan in such a way that this childish nonsense could continue to play out its signifying repetition to this very day, then it would be just too much of a pity to allow so similar a piece of non-sense to go unmarked. Since it would be ludicrous to suggest that it is ‘neither here nor there’ whether it is a fort’ or a ‘da’, an ‘ooo’ or an ‘aaa’, an o object or an objet a, that is in question, and since it would be a foolish form of censorship to eradicate the difference merely to serve the interest of a uniformity of style, we have left it to each author to decide on the appropriate term. Objet a or o object? – each author’s choice of signifier is represented here in this issue.